APB ("All Points Bulletin") was an Atari arcade game designed by Dave Theurer, who also made the classic games Missile Command, Tempest -- the best arcade game ever made, for my money -- and I, Robot. It was the forebear of the original, overhead view Grand Theft Auto games. 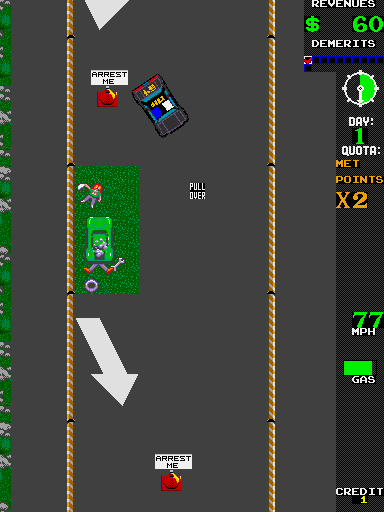 It was primarily a driving game; you were a police officer, and had a certain amount of time to arrest a certain number of miscreants (hitchhikers, litterers, speeders, etc.) while avoiding getting demerits. It was fairly challenging. On each round, there was a special "super villain" you could arrest to end the round immediately and get bonus points. The game was published in 1987, also known as "a few years before the Rodney King incident." If you caught the super villain -- the first one was a hippie -- the view switched to an exterior view of the interrogation room, with you and the suspect visible in silhouette. Your fat, stupid, donut-eating sergeant was slowly walking down the stairs. You then slapped the buttons fast and hard to "interrogate" (read: beat up) the suspect. If you beat him up enough before the sergeant came in to the room and witnessed the rights violation, he would confess. It was popular at the time for Congressmen, Senators, and other idiots to complain about the values that videogames taught "our children," but I never once heard a Congressman or law enforcement official complain about the values taught by a game that gave you points for beating up a suspect.